5 Bedrooms/3 Bathrooms, sleeps 10 comfortably. Themed Bedrooms, Coastal, Seaside, Animal, Disney. Our beautiful, spacious, 5 Bedroom Villa with extended decking area housing the pool/jacuzzi. Catching the sun from early morning until sunset. Overlooks a lake and is absolutely brilliant watching the wildlife in and around the lake, very relaxing and peaceful setting. Plenty of sun loungers, chairs. Eat alfresco around the poolside table. Pool has been resurfaced and is looking really sparkling with the abalone shell glinting in the sunlight. Ideally located for easy access to major theme parks, Disneyworld is just 11 miles away. Supermarkets, restaurants, malls are just minutes drive away. We have added a number of upgrades for our guests comfort. Highspeed internet, Wifi access, Free local, USA, Canada calls, free UK landline calls. Breakfast nook with seating for 4. Dining area for the formal meal with seating for 8.
cutlery, serving dishes, etc, etc. Games Room 90 inch. pool table, football table, table tennis table 50" TV to enjoy the sports whilst using the facilities. Games console and selection of games. All the bedrooms have good quality Sealy posturpedic beds. The villa has 2 Queen Master en-suite bedrooms, located downstairs. The upstairs bedrooms: 3rd Queen sized Bedroom, is coastal themed, 4th twin bedroom ideal for the kiddies, is Disney themed, there is a games console for their use. 5th Bedroom is twin bedded and animal themed. We have just added a number of enhancements to the villa for our guests comfort and enjoyment. FOR THE SERIOUS GOLFERS: Nearby Amenities On the 192 which is 4 minutes drive away you will find a number of restaurants and shopping malls to choose from. 11 miles to Disneys main entrance . About 5 minutes drive away there is Champions Gate, a PGA Championship Golf Course designed by Greg Norman. 5 minutes drive away on the 27 there is a 24 hour supermarket, Chinese,Italian Restaurants. MacDonalds & Subway takeaways, video & game rental, Pharmacy, Dry Cleaner and Beauty Salon on the 27. Air Boat Rides, Golf Courses, Fishing, Water Sports Within 20 to 80 minutes driving distance you can find all of these other attractions: MGM Studios, Busch Gardens, Islands of Adventure , Seaworld, Universal Studios, Watermania. At Downtown Disney Cirque Du Soleil. Disney's Animal Kingdom, Gatorland (which I can recommend) , Kennedy Space Center, Wet n’Wild and Pleasure Island. Drive time to Orlando Airport is only 35 depending on traffic. FISHING FOR RELAXATION: Orlando has a number of large lakes again details will be found in the tourist information booths and the malls. There is a state park about 7-10 minutes drive,from our villa. We just love winding down with a short drive and then watching the mirror like lakes and the abundance of wildlife, is truly fascinating. The Gulf Coast is our favourite getaway especially St. Pete's Beach, brilliant beaches, great boat trips, you will more than likely see the dolphins. You can always take up a spot of sea fishing. Off the Beaten Track, for those not wanting to go to the parks and have a day mooching around flea market, antique market. I can recommend Rennigers which is on the 441 North, it is held on a Saturday and Sunday, it is my absolute favourite place to go, I spend hours just browsing around. The antiques booths have a cross selection of antiques, there are also some nice jewellery booths, some make beautifully jewellery, one off pieces, thats if you have not spent out and want that something special. Then across the way I pop into Mount Dora which is a quaint town, browse around the gift shops, have a coffee and sandwich, or pop into the Goblin Market, which is a nice little restaurant up one of the side streets. FOR THE YOUNG AT HEART: Last but not least, we are ideally situated for easy access to the roads leading to Disney world which incidentally is 11 miles from Hampton Lakes. Universal and Island of Adventure is absolutely awesome, not far from International Drive, possibly about 30-45 minutes drive from Hampton Lakes. The above are just a few of the attractions, there is absolutely loads to do and see, you will certainly tire yourselves out. Then you can come home to your villa and wind down and relax in the pool/jacuzzi and watch the magnificent sun set. What more can you want. Please note 12% sales and tourist taxes are included in our rates. Final clean included on bookings 7 nights and more. Extra cleans can be arranged during guests stay, paid locally to our management company. We found the ideal setting for our Orlando home. Ideally located for easy access to the parks. Over the years there has been a great deal of investment on the 27 for instance restaurants, supermarkets, small shopping malls. All this just minutes drive away. Plenty of golf courses, again just minutes drive away. The villa itself overlooks a small lake, where there is an abundance of wild life. We love it and I am sure our future guests will enjoy it too. The three bathrooms have towels provided. Hairdryers in each. Plenty of linen provided, with a spare set to change. Driveway enough for two cars. A selection of toys for the kiddies use. Front garden with selection of shrubs. Tennis courts on site, tennis raquets and balls available in the villa for our guests use. There is a step leading into the villa, 1 of the master bedrooms has an extra wide door allowing wheelchair access, 4" approx. steps into each of the showers. Lovely pool and decking area. Remember Keep children safe at all times, do not leave them alone in the pool. The villa sleeps 10 plus crib comfortably. The villa is ideal for a family and people of all ages. Free USA calls, Free Canada Calls, free UK landline calls. Highspeed internet/wireless access Patio door alarm - advisable to be used when the little ones want to use the pool. There is a travel cot also provided. High chair. Baby buggy. Security Cameras on the front and sides of the villa. There are tennis raquets provided for our guests use. Gas BBQ can be arranged via our management company for an additional charge. To be used outside the screen area for safety reasons. Games Room, Pool Table 90 inch, table tennis, Foozeball. WE ARE CONTINUALLY ADDING TO THE VILLA FOR OUR GUESTS COMFORT AND ENJOYMENT. On site facilities communal pool. Tennis courts, volleyball. Kiddies play area. Easy access to the the main routes, highway 192, and the I4 giving you a choice of direction heading to the theme parks. Disneyworld approx. 15 mins. drive, depending on traffic conditions. 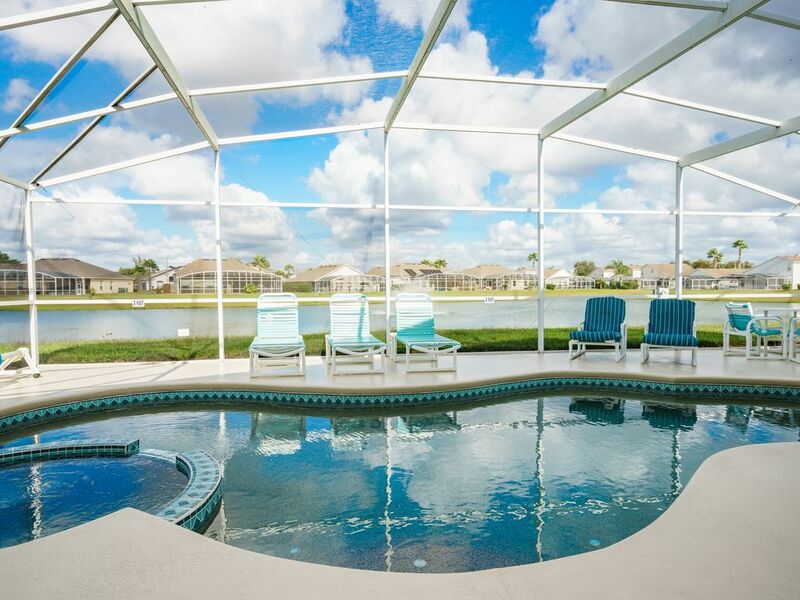 The villa is situated just off of US27 which is ideal for the theme parks and shopping. The villa is well appointed with TV's in every bedroom a great games room and a pool with a lovely views onto the lake. Thank you for your lovely review. Pleased you enjoyed your stay and the villa. This was our first time in Florida so when we got to our villa it was a pleasant surprise as it was exactly as advertised. The villa had everything we needed and more, the view over the lakes whilst on the pool terrace was very peaceful and made for some good down time from all the huddle and bustle of Disney. The villa was in a great location with restaurants and shop with 10 minutes and Disney/Universal was about 20 minutes.Myself and my husband ventured over to the highland reserve golf course and it was well worth the visit they even hire the clubs. If your looking for a great place to stay whilst in Florida give this villa a try you will not be disappointed. Had a great time - villa everything that owner advised. Easy to get to and all facilities in villa easy to work. Thank you for your review. I am glad you enjoyed your vacation and our villa. I cannot remember how many times we have used Carol's and George's villa over the last 15 years or so - we have literally lost count. The best compliment we can make regarding the whole experience is we would be devastated if ever we were able to go and the villa was unavailable. All amenities available at the villa are of the highest quality and the back up from the owners and the service company in case of need are beyond reproach. We returned from there last week and have already booked our next stay. Thank you again for a great review. As you know we are continually striving to keep the villa up to date and maintained to a high standard for our guests comfort. Well equipped villa, good location. Well equipped villa with everything we needed for our holiday. Good location for Disney and Universal, also supermarkets etc close by. Amazing villa - exceeded all of our expectations! We have just returned from a 2 weeks holiday staying at Relax Villa. The villa is situated on the Hampton Lakes development and is ideally placed for all the main theme parks, supermarkets, restaurants and I4 nightlife. The villa is spacious and airy with 5 really good sized bedrooms. There is a full kitchen with every utensil that you could possibly need. There is a pantry in which Carol/George the owners have left stocks of items which guests can use if the need to. The lounge is roomy with two sofas and a huge tv to flop in front of after a full day at the theme parks. The pool is a fabulous benefit - has lots of loungers and toys for kids to splash about with. The pool looks out into the lake where we watched lots of turtles splashing about. The garage is another huge plus as it contains a pool table, table tennis table and a table football table and a games system. There is a huge washIng machine and tumble drier at the villa that we made good use of plus 2 airers in the garage which we really handy. There is a huge stock of towels and extra bedding for guests to use which is a huge plus. There is both a Walmart and a Publix (which we preferred) within 10 minutes drive. There are lots of great eateries close by including Mandy's Chop House which we loved. Carol and George the owners are absolutely lovely people and we're extremely supportive when my husband was taking Ill and hospitalised during our stay (he's on the mend now) - calling regularly to see how he was doing and offering help. In conclusion the villa is absolutely fantastic and we couldn't have wished for a better place to stay. When we return to Orlando we wouldn't dream of staying anywhere else. There are lots of properties in Orlando that's true but I don't think you could find one so fantastically located, so brilliantly furnished and stocked with such lovely owners. I would like to say a big thank you to Hayley and family. We appreciate your kind comments. I am sure your review will guide people to what the villa and area of the villa has to offer young and old alike. We are not to far from the I4 and the 192 the main roads to Disneyworld and all of the other attractions. Located just off highway 27. In probably less than five minutes in either direction there are supermarkets, restaurants, pubs. There are Championship golf courses nearby, nearest approx. 3 minutes + away. There are at least another 30 golf courses within 30 mins. drive. Definitely a golfers dream. There is a state park, again not too far away, there is also a winery where you can taste and buy the wine. Off the beaten track, there are a number of places to visit, if you want a break from the theme parks. Just ask, I will be only too pleased to offer advice on where to go. Gulf Beaches are approximately 1 hour 30 minutes drive, again I can recommend our favourites. Disneyworld is 11 miles away. Easy access to all the other major theme parks by using the 192 or the I4. Golf: Over 30 golf courses within 30 minutes drive, nearest championship course a couple of minutes drive. Pool Heat is recommended between October to April and is an additional £15.00 per night minimum nights 7 7+ Guest will incur an additional cleaning fee of £80 . Security deposit £150, normally refunded within 21 days of departure. Excessive washing is not acceptable. Stained or damaged linen, must be replaced with same. Any breakages and or damage must be reported immediately to management to avoid security deposit being withheld. The villa must be left in a clean and tidy condition on departure.